The formula comes in a really easy to use pump spray bottle so you can blast it all over your hair like you would a heat protection spray. I still continued to use a few pumps of serum just to calm and protect my hair, but you don’t have to use any other products if you don’t normally. I sprayed about ten pumps into my hair to make sure it was all covered well and then blasted with a hair dryer as normal. I did notice that my hair was about 50% straighter than it would be without the 3 Day Straight, even through just blow drying. It seemed a lot less of a ‘hedge backwards’ look and a bit more manageable, which obviously made the straightening part easier. When I did straighten (as this locks in the formula apparently) my hair was easier to control and style, making the overall look sleeker. Normally when I style my hair I need to leave it for a few minutes and go back over it, but with 3 Day Straight it was pretty perfect first time. 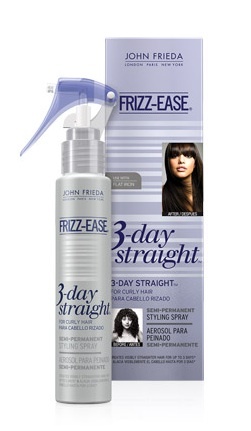 John Frieda encouraged me to do loads of different trials to test the product to its full capacity, but I’ve been a bit crap with that. I did do my normal thing of running all over the place, getting hot and sweaty, organising a fashion show, going on a big night out and spending half my life on a tube, so I felt that was sufficient enough to test it! I normally have quite a lot of ‘flickage’ by the end of the day, with my hair going all over the place in different directions, but with this there was no ‘flickage’ whatsoever. My hair looked the same at 7pm as it did as 7am and people even commented on how long my hair looked because it was so straight. Sleeping on it wasn’t a problem – bed hair was (almost) banished, as I awoke from my slumber with only the minimal amount of disruption rather than looking like I’d spent the night on a bench. The time I did come into difficulty was when I tied my hair up and put on a shower cap for the shower… this seemed to shake it up a bit and cause a bit more ‘flickage’ than I would’ve liked, but it wasn’t unsalvageable. You won’t completely be banishing the straighteners with this as your hair will probably still need a touch up, but it will save a lot of time on styling. I normally wash my hair every day, or every other day if I’m being lazy and have nowhere to go, so keeping one style for three days was somewhat a challenge. I technically did three days, but I have to admit I washed it pretty much straight away on the third for fear of smelling or looking like a chip shop. Three days is a long time to keep hair in tip top condition, but 3 Day Straight pretty much seemed to get me there. It’s not completely solving all my dilemmas, but it has made my hair more manageable and easier to deal with on ‘day two’ – there’s been a lot more ‘day two’ hair popping up over the last two weeks as it still looks pretty decent. The only negative is that it does leave a slight residue on the hair so you can feel there’s something there. It’s not a massive issue as it’s only slight to the touch, but when you run your fingers through you can tell that you’ve got product in. I do really like this and think at £6.99 it’s a pretty bargainous product that’s worth a test. It’s no Brazilian Blow Dry, but it may get you through a weekend away or even a festival… that’s got to be a bonus. Available nationwide through all good chemists and supermarkets priced at £6.99 for a 100ml bottle. I love this product! I have very thick, curly hair and it takes me an age to dry it, not blow dry it, just dry it before battering it with hair straighteners. But this cuts down the drying time significantly, makes my hair much more manageable and gives me a much better hair day on the 2nd day. Finally a product that does what it says on the tin. It's definitely worth a try. The price makes it accessible too as you're not paying out a fortune to see if it works for you. Thumbs up from LBQ! I wonder if it works as well if you don't use straighteners after you've blow-dried? I have fine hair and I usually blow dry my hair straight and then maybe just straighten the ends. If I straighten all of it my hair goes very flat, thin and limp. But I like the idea of it not curling up in the rain or damp conditions. Anyone else just used it with a hairdryer and not straighteners?